Mumbai: HDFC Bank Ltd, the largest private sector bank in India, was India’s most valuable brand for the third successive year, and emerged on top of the BrandZ Top 50 Most Valuable Indian Brands ranking released by WPP Group and Kantar Millward Brown. 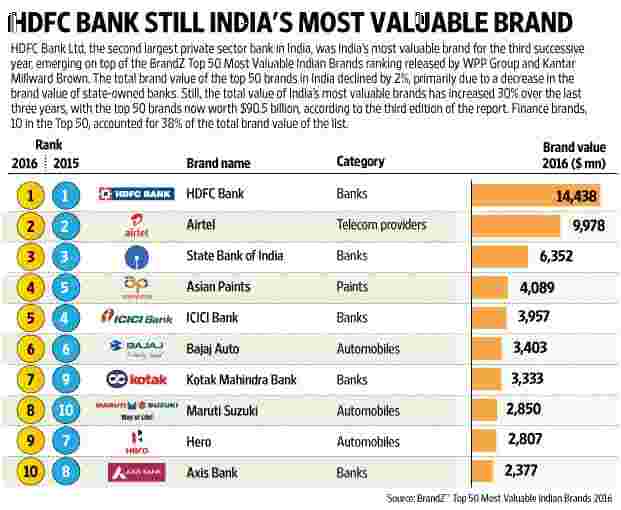 HDFC Bank was also the only Indian brand in the BrandZ top 100 most valuable global brands list released in June. 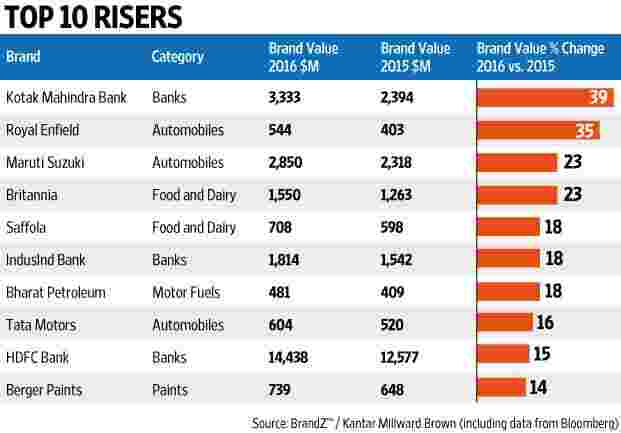 The total brand value of the top 50 brands in India declined by 2%, primarily due to a decline in the brand value of state-owned banks. Still, the total value of India’s most valuable brands has increased 30% over the last three years, with the top 50 brands now worth $90.5 billion, according to the third edition of the report. “The 2016 BrandZ study shows the extent of change India has witnessed and its continuing potential. India has relaxed ownership rules across key industries and is making doing business easier," said David Roth, chief executive officer, EMEA and Asia, The Store, the global retail practice of the WPP Group, in a statement. “Fundamentally, a brand is what we stand for in terms of the emotional value and the real value that we want to deliver to the customer," HDFC Bank managing director Aditya Puri said. “The emotional value is a combination of honesty, trust, integrity and being able to deliver the product at all times to the satisfaction of the customer. The real value is to deliver a differentiated product which changes the life of the customer which we have tried to do in financial services by making it more convenient." Finance brands, 10 in the Top 50, accounted for 38% of the total brand value of the list. For the first time in three years, a retail brand, Reliance Retail, found space in the Top 50, signalling the emergence and growth of modern retail in the country. The list of the brands that grew the most in terms of brand value reflected the increase in discretionary consumer spending and the diversification of the nation’s economy. Royal Enfield ($544 million), an aspirational motorcycle brand, increased its brand value by 35% over the past year, as it upgraded its models and expanded its dealer network to 500 locations, including 100 added in 2015. Maruti Suzuki India Ltd ($2.9 billion), saw a 23% growth in brand value on the back of its introduction of premium car models to drive revenue and profitability. Despite slower growth in the packaged foods business, Britannia Ltd ($1.6 billion), which sells bakery and dairy products, grew its brand value by 23% as it expanded distribution in rural India. Of the Top 50 brands in India, 38 were of Indian origin, up from 35 in 2014. Interestingly, this is the first time globally that the BrandZ report thought it necessary to list 25 emerging entrepreneurial Indian brands in the report. While these brands did not qualify for the main listing, they have managed to create a dent in the market. The list includes consumer products brand Patanjali Ayurved, personal care brand Forest Essentials, and start-up brands BookMyShow, Flipkart, Ola and Paper Boat. Some of these could well find a mention in the ever-changing main listing in coming years. After all, the only brands that managed to protect their rankings over the three editions of the survey were those that increased their brand value by over 35%, according to Dinesh Kapoor, Kantar Millward Brown’s managing director for South Asia. Still, “20 brands have witnessed a drop in their ranking within the Top 50," he added.